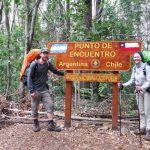 After some great hikes on the Chilean side of Patagonia (Cabo Froward, Isla Navarino, Torres del Paine) we crossed the border to Argentina. There we got real close to a glacier, the Perito Moreno Glacier near El Calafate. El Calafate is a very touristic town in the south of Argentina, full of hostels, hotels and restaurants. 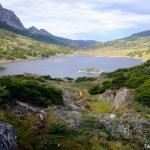 It is named after the calafate berries that we love to pick on our hikes. 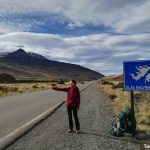 We reached El Calafate from Puerto Natales in Chile by hitchhiking. It was a little tricky to cross the border. 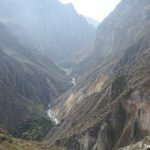 We got a ride to the Chilean border guards, then had to find someone to drive us the 8 km to the Argentinian border guards. From there on, we walked a bit until a kind Dutch couple invited us for a ride on the back of their rented pickup truck. For probably three hours we drove through the Argentinian Pampa. All we saw were wide empty plains, no trees, no agriculture, only some condors circling above us. And of course, there was loads of that Patagonian wind again. 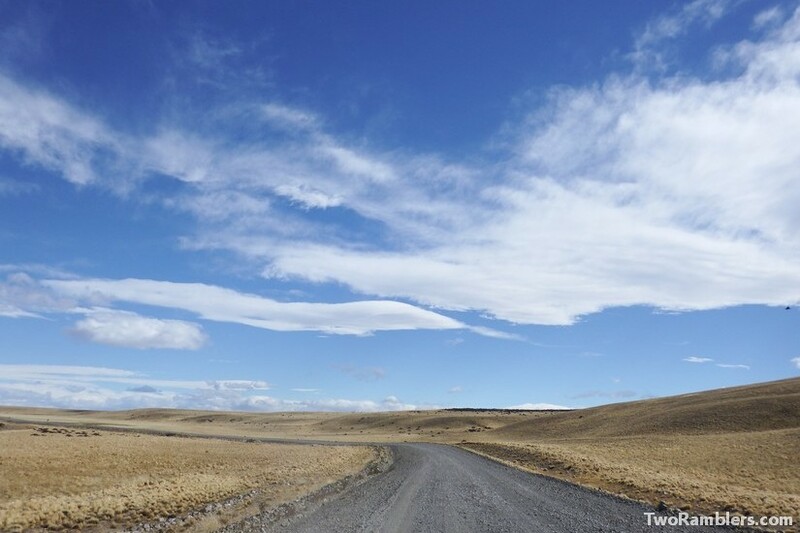 The couple dropped us off at a crossroads about half an hour from El Calafate. Quickly we found a ride for the last part. A guy in his fifties told us all about fishing in the area. He had been out trying to catch something the whole day and must have had a few beers while waiting. Happily we got out of his car and put up our tent at a cosy campsite in the centre of town. 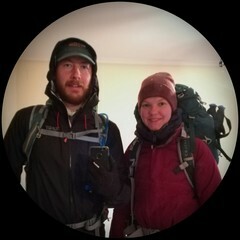 The next morning we tried to hitchhike to the Perito Moreno glacier. But quickly we realised that luck was not on our side. There were almost no cars going the right way and we had some competition who had been waiting for longer. So, we decided to take a bus in the afternoon. After a good lunch – Kevin finally got the Argentinian Milanesa (a schnitzel) that he had been wanting for a while – we got on the bus. It brought us to a visitor centre and left us for three hours to stroll around on a walking circuit opposite the glacier. 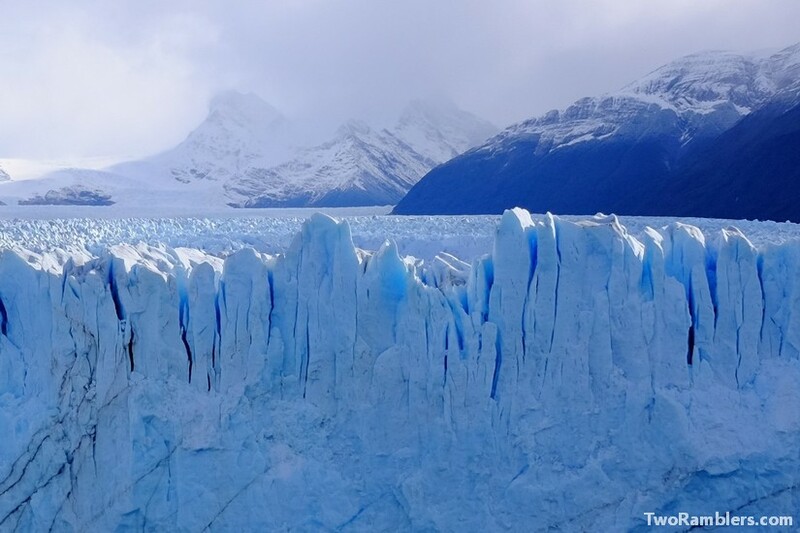 We were stunned by the views on this massive wall of ice. From where we stood the glacier was about 70m high and 5km wide. Impossible to take it all in at once. 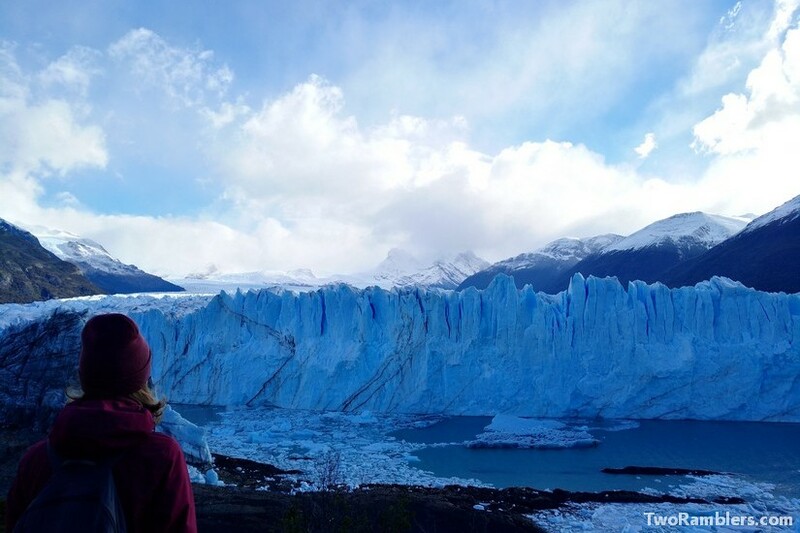 To the back it seemed to stretch endlessly, probably because the Perito Moreno Glacier is part of the South Patagonian Ice Field. We walked along on steel bridges to different view points, getting different views on the glacier. Now and then we would hear a cracking noise, followed by a splash. It was pieces of the glacier falling off into the water. 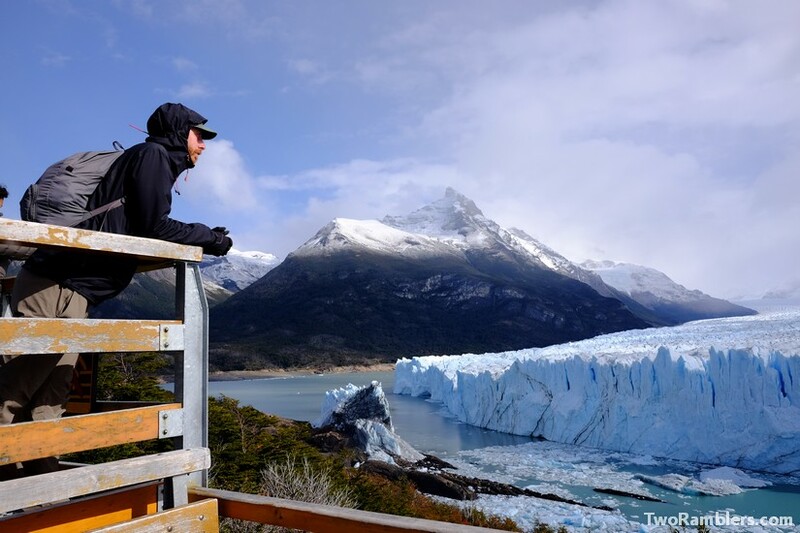 As we learned from the information boards along the walking routes, unlike most glaciers Perito Moreno is still growing. As it is pushed forward, pieces of it break off. Just a few days before we were in El Calafate, a big part of the glacier forming a bridge to the piece of land we were standing on had collapsed. 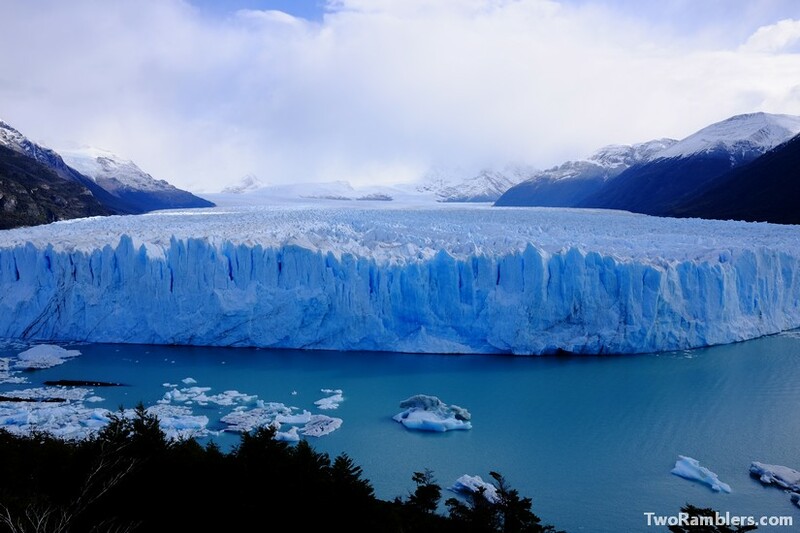 It had such an impact that water levels of Lago Argentino, to the north of El Calafate had risen by more than a meter. Our bus had been the last one to arrive that day and was going to be the last one to pick us up again. So while most tourists had left we were still watching the glacier. As the sun started to set it got chilly but we kept waiting. Our reward was a big piece of ice breaking off and crashing into the water. Then we went back to the bus and found everybody else already waiting for us. We were the only ones who had seen the last spectacular crash. It was a special feeling standing in front of so much ice. We felt very small and were wondering how so much ice can exist in this place, so close to the sunny Pampa. An experience we will remember!